Opposition to the Promised Messiah (as) had started even before the Ahmadiyya Muslim Community had been properly established and he had not yet taken the Bai’at (oath of allegiance) from anyone. Both Muslims and non-Muslims alike put all their energy into opposing him, and this continues today. Nowadays it is the Muslims who display greater opposition, however Allah the Almighty continues to cause the Community of the Promised Messiah (as) to grow and flourish. With the Grace of Allah, the [Ahmadiyya] Community is now established in 209 countries of the world. As I have mentioned in several of my previous Friday Sermons, the Ahmadis of Algeria are currently being targeted for cruelty. Therefore, we must remember these oppressed and persecuted members in our prayers. May Allah the Almighty grant them steadfastness and shield them from this oppression. Similarly, you should remember the Ahmadis of Pakistan in your prayers. There too, especially in the Punjab [province], a well-planned scheme of persecution against Ahmadis is being executed. Huzur stated that the signs foretold by Allah and His Messenger have clearly been fulfilled and continue to be fulfilled in connection with the advent of the Promised Messiah. This path alone is the one that can restore for the Muslims their lost honour and greatness. Thus, those who oppose the Community are acting against the Will of God. They are in fact opposing God, and such people have not hindered anything in the past and neither will they ever do so in the future, InshaAllah (God Willing). The Help and Succour of God has always been with the Promised Messiah (as). In Algeria, they thought that they were eliminating Ahmadiyyat. Newspapers and the media gave ample coverage of this and published material against the Community that was spread widely. Indeed, the newspaper played a prominent role in opposition to us. However, this very opposition actually became a means for propagating the message of the [Ahmadiyya] Community. The Promised Messiah (as) has also said that all the material against us in literature and books actually encourages people to read our books and draws attention to them. Further the Promised Messiah (as) said that this was the time that was destined for him to appear and his advent was according to the decree of Allah, so that he could secure and stabilise the wavering ship of Islam. There are many who write their personal accounts about how they accepted Ahmadiyyat and when reading those, one cannot help but be amazed at how God Almighty provides the means of acceptance for all those who are pure natured. Huzur then related some of these accounts. The first account Huzur related was from Algeria wherein the person writing the account said that he saw two people in his dream. One of the two had a white beard whereas the person to his right was of middle height, his complexion was a colour similar to wheat and his hair and beard were black. After he was introduced to Ahmadiyyat and started watching MTA, in the first few days he was shown a picture of the Promised Messiah (as). Huzur’s Sermon was then shown and upon seeing Huzur’s picture he said ‘when I saw both of these images I thought of my dream.’ He then took the Bai’at [pledge of allegiance to join the Ahmadiyya Muslim Commmunity]. The Amir [National President] of The Gambia writes that a lady, Sinta Sahiba, who lived in a village in the district of Niabini severely opposed the Jama’at. Whenever the name of the Jama’at was mentioned before her, she would become extremely angry and would use very strong language when speaking against the Jama’at. She would say that Ahmadis are Kafir [disbelievers] and they are hell bound but even those who keep any kind of ties with them will also be destined for hell. The lady was a farmer and owned land but her crops had been spoilt for the last two years, whether it be because of pests or other animals which would spoil the crops however she could not understand why this was happening. An Ahmadi lady said to her that ever since she had begun opposing the Jama’at, her crops have not grown, therefore she should give up opposing the Jama’at and instead enter the Jama’at. Then, Allah the Almighty will bless her crops. The lady understood immediately and agreed to experiment this. She, along with eight members of her family accepted Ahmadiyyat and saw that since joining the Jama’at, Allah the Almighty had blessed her abundantly. Not only did her crops begin to grow plentifully but she also came into contact with one of her sons, whom she had lost contact for a number of years and was currently living in Italy. Now, this lady tells everyone to join the Ahmadiyya Community because in this lies the means for one’s salvation. A missionary of the Community from Benin writes that this year there was extreme torrential rainfall during the monsoon season in the town of Bassila and as a result one of the walls of the mission house collapsed. The rain continued to fall even during the night and there was a danger that the second wall [of the mission house] may also collapse. He says that he was extremely worried due to the loss sustained to the Jama’at’s mission house and thus thought that he will pray (such a thought can only to come our missionaries) that ‘O Allah! Recover this loss through Bai’ats and bless the progress of the Jama’at.’ He says that he had not even finished the prayer that the phone rang. It was twelve o’clock at night and the rain was extremely strong and there was also lightning. He picked up the phone and a gentleman by the name of Mohammad from the Bocha village was on the line and said that the people of his village would like to do perform Bai’at. This village was situated 110 kilometres from the mission house. He [the missionary] says that the next day, or a few days later, he travelled to their village and 198 people did the Bai’at and entered the Jama’at and despite the fact that they face extreme opposition, they are firmly attached to their faith. Thus, Allah the Almighty guides people in the most peculiar of ways. Huzur said that although he has related many such incidents that have taken place in Africa and has also mentioned that preaching in those areas is extremely difficult, but some people think that since people in Africa are not very educated therefore they easily accept Ahmadiyyat. However, this is completely wrong. The so-called scholars of these uneducated people have enmeshed them in all kinds of rituals and harmful innovations in order to maintain their means of livelihood and establish their exclusiveness. Those who follow these scholars also do not want to detach themselves from them and it is because of this that our Jama’at faces opposition and this has already been mentioned this in some of the incidents that he had related where people in Africa oppose the Jama’at. Thus, to accept Ahmadiyyat is not something easy, however Allah the Almighty continues to provide the means for their guidance and also reveals to our Mubilgheen [missionaries] and Mualimeen [local preachers] as to how they should preach. 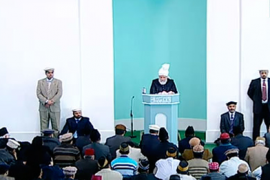 Huzur said that Allah the Almighty guides many people through dreams and people are experiencing this form of guidance in every part of the world. The Missionary In-charge of India writes about an incident of the acceptance of Ahmadiyat of a person who recently converted [to Ahmadiyyat] in Kannur Kerala. This new convert used to be very distressed prior to doing the Bai’at and someone told him that reciting Durood [sending salutations on the Holy Prophet (saw)] was a solution to alleviate his worries and that he should read the Durood extensively and thus he began to recite the Durood. One day he saw the tomb of the Holy Prophet (saw) and also saw an empty grave. A person then came and said that the Holy Prophet (saw) has stated that they will meet each other very soon. He related this dream to a non-Ahmadi Maulvi and he said that this was a very blessed dream and that he was to attain a very lofty status. A few days after experiencing this dream, he met an Ahmadi while travelling to somewhere and the Ahmadi told him to visit the Noor mosque in his area. And so, one day he went to the Noor mosque in his area and offered the Friday prayers. Through this he was introduced to the Jama’at and began reading the literature of the Jama’at. He later performed the Bai’at and joined the community. He says that it is clearly evident that the interpretation of meeting the Holy Prophet (saw) very soon was that he was going to join the Ahmadiyya Jama’at. There are many incidents of this nature where attempts have been made to distance people from Ahmadiyyat due to enmity. However, this is the work of God Almighty and as the Promised Messiah (as) said that ‘we are making progress each day’. Many people come themselves to learn about Ahmadiyyat and witnessing such incidents we are also a witness to the fulfilment of this statement by the Promised Messiah (as). May Allah enable these people to become worthy of accepting the guidance imparted by God Almighty and may He open their hearts. He was born on 28th June 1929 in Copenhagen and affiliated with Lutheran church. He was heavily influenced by the Danish philosopher and reformer by the name of Ludwig. He accepted Islam on 26th January 1956. Initially he accepted Islam because of a woman he intended to marry, however, later he himself studied Islam thoroughly and from then on he accepted the teachings of Islam whole heartedly and began to act upon them. In 1964, he performed Hajj for the first time accompanied by his wife and there he prayed extensively for the progress of his spiritual progress. .” God Almighty accepted his prayers by enabling him to join Ahmadiyyat and after joining he had the opportunity to perform Hajj again, as well as countless Umrah’s [pilgrimage performed outside the prescribed time for Hajj]. He served the community in various capacities and presented an exemplary model of financial sacrifices. With respect to his financial sacrifices, Hazrat Khalifatul Masih IV (rh) once wrote in a letter: ‘The financial sacrifices presented by Hansen Sahib is worthy of being emulated. By the Grace of Allah, from the outset he was exemplary in offering sacrifices and in sincerity. In terms of financial sacrifices he is an example and never needs to be reminded.’ Hazrat Khalifatul Masih IV (rh) further stated: “May Allah enable other Jamaat members to become like him, and should this happen, the role of the financial secretary will only be to maintain records and he would never need to spend time in sending reminders.’ May Allah enable this to happen. May Allah the Almighty elevate the status of the deceased and may his wife and children be granted the opportunity to accept Ahmadiyyat.